To fit into March’s theme of Visibility, today we’re talking with Rosie Colosi from Write with Rosie, about where and how to start when it comes to getting published. If you’ve never been published before, it can be overwhelming trying figure out how to pick the best avenue when there are so many options out there! An important thing to remember here is that getting published anywhere will help build your credibility. As mentioned in a previous FearLess Podcast episode, knowing how to pitch is helpful when reaching out to media outlets. Rosie dives a little deeper into pitching to print publications and shares knowledge on the types of submissions – open, closed, unsolicited, etc. Plus, she provides helpful tips on how to prepare when going about that pitch! Also, when was the last time you looked at your About Me page? Months? Years? Decades? We know, who has time for that? Rosie makes a case for revisiting your About Me page on a regular basis. She provides suggestions on how to make a stellar page that doesn’t come off too braggy while still showcasing your expertise. If you’re looking for a professional to rework your About Me page, Rosie is here for you. She helps creatives make their writing sparkle by showcasing individuality, humor, and heart! This is a great episode if you’re looking to pitch publications, whether it be online or in print, and are unsure of how to go about it. As always, please subscribe to the FearLess Business Podcast wherever you listen, and we are always eternally grateful for a review. Please join us in the HQ to continue the conversation! 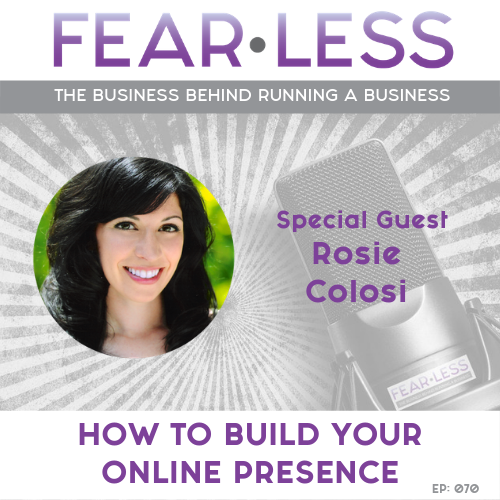 The Fear Less Business Podcast provides a behind the scenes look at all of the topics you may be afraid to tackle in your business, but shouldn’t be. Bringing combined expertise from legal, manufacturing and running their own businesses, Jamie and Mary bring great guests and insights from their experiences to provide listeners with valuable information to help move their businesses forward.